Virtual realities are increasingly used in the field of psychiatry, with the latest 4D VR system being rolled out at Bio Korea 2018. Although VR is commonly used for games or the cinema, a research team from Samsung Medical Center focused on developing a system that helps people medically alleviate tension and bring them psychologically comfort. 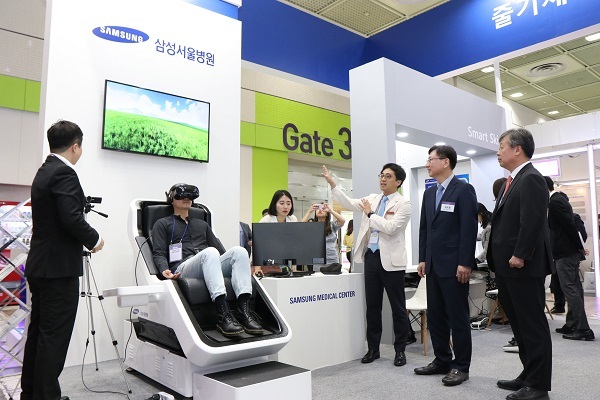 Kwon Oh-jung (second from right), head of Samsung Medical Center, visits the VR-bio feedback system on display at Bio Korea 2018, in COEX, southern Seoul, Thursday. The system, comprised of a VR goggle and motion chair, allows people to partake in relaxation exercises with a sense of immersion to relieve depression, anxiety, and stress. The team led by Professor Jeon Hong-jin from Samsung Medical Center’s department of psychiatry worked with Samsung Electronics, CJ, and the Ministry of Science, ICT and Future Planning to develop the system. The team said it also worked with doctors from SMC’s department of ENT and ophthalmology and the Samsung Electronics VR team to handle dizziness, a common problem people experience with VR.